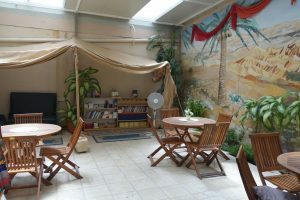 Another place, where MediaServe have provided Scriptures, is a Bible shop in southern Israel. It’s a beautiful place where everyone is welcome and all literature is given free of charge. Whilst visiting the shop, two Bedouin Muslim girls, covered from head to toe, opened the door, peaked in cautiously and asked if they could come in. They wanted a gift for their friend. The shop has only Bibles and Christian materials! One of the volunteers started to talk to them and gave them an Arabic New Testament. They were also given Arabic audio Bibles, which one of them started to listen to right away. As we sat in the Café, we overheard how Isa (Jesus) was introduced to the girls. They lingered in the shop for about half an hour and were full of smiles when they left. An elderly man, who has lived in Israel since 1948 said, “This is a new day in Israel. Before, it was unheard of that Bedouin men would enter a Bible shop, let alone Bedouin girls! The manager of the Bible shop told us: “People are hungry for the truth but they need a neutral place to ask questions a place which is not a church. A few years ago, we didn’t get orthodox people in our book shop but now we get them all the time” Several years ago, we were told there was a need in Israel for a small booklet that presents Yeshua in a clear way that will be understood by the Jewish people, using text and illustration. We’ve also heard from those we work with that there is the same need amongst Messianic congregations in the former Soviet Union. Together with a team in Israel, this booklet is finally in the making! Would you like to help us make this happen?